Derbyshire County Cricket Club was established in 1870. Cricket was played in the summer and in 1884 William Morley, a committee member, suggested the club formed a football club. Derby County selected the colours of amber, chocolate and light blue. The following year Derby County took part in the FA Cup competition that had been established by the Football Association in 1871. They defeated the mighty Aston Villa in the second round but was eventually knocked out by Small Heath Alliance. On 2nd March, 1888, William McGregorcirculated a letter to Aston Villa, Blackburn Rovers, Bolton Wanderers, Preston North End, and West Bromwich Albion suggesting that "ten or twelve of the most prominent clubs in England combine to arrange home and away fixtures each season." John J. Bentley of Bolton Wanderers and Tom Mitchell of Blackburn Rovers responded very positively to the suggestion. They suggested that other clubs should be invited to the meeting being held on 23rd March, 1888. This included Derby County, Accrington, Burnley, Notts County, Stoke, Wolverhampton Wanderers, Old Carthusians, and Everton should be invited to the meeting. The following month the Football League was formed. It consisted of six clubs from Lancashire (Preston North End, Accrington, Blackburn Rovers, Burnley, Bolton Wanderers and Everton) and six from the Midlands (Derby County, Aston Villa, Notts County, Stoke, West Bromwich Albion and Wolverhampton Wanderers). The main reason Sunderland was excluded was because the other clubs in the league objected to the costs of travelling to the North-East. McGregor also wanted to restrict the league to twelve clubs. Therefore, the applications of Sheffield Wednesday, Nottingham Forest, Darwen and Bootle were rejected. The first season of the Football League began in September, 1888. Preston North End won the first championship without losing a single match and acquired the name the "invincibles". Major William Sudell, had persuaded some of the best players in England, Scotland and Wales to join Preston: John Goodall, Jimmy Ross, David Russell, John Gordon, John Graham, Robert Mills-Roberts, James Trainer, Samuel Thompson and George Drummond. Derby County, who had finished in 10th place, decided to follow the example of Preston North End and recruit the best players available. At the end of the season Derby purchased Preston's John Goodall, who had scored 20 goals in 21 games for the league winning team. Derby County finished in 7th place the following season. However, they were embarrassingly knocked out of the FA Cup in the First Round by Everton 11-2. This remains the worst defeat in the history of the club. Steve Bloomer signed for Derby County in 1892. Bloomer developed a good relationship with John Goodall. Bloomer later said that "Goodall took the greatest interest in me when I was a kid. He coached me, secured me for Derby County, played with me and never failed to give me valuable hints and advice." Bloomer was an immediate success and that year scored 11 goals in 28 games. Although his club struggled that season and only narrowly avoided relegation. Steve Bloomer's 18 league goals helped Derby County finish in 3rd place in the 1893-94 season. The following year he won his first international cap playing for England against Ireland. Also in the England team was his mentor John Goodall. Frederick Wall, the president of the Football Association, considered Bloomer the best goal scorer he ever saw: "He was a great marksman, and his splendid passes were generally made with one touch. He had no time for fancy work. Bloomer, of course, made mistakes like everyone else, but he was the superior of everyone I ever saw as a scorer. A great volleyer in front of goal, he placed his ground shots at a fast pace, out of the reach of the keeper and slantwise. But the keepers used to say that it was difficult to tell which foot he would use for a shot. Bloomer's England captain, Ernest Needham, later recalled: "Bloomer... is said by a good many judges to stand in a class by himself. He plays to get goals, and when he is in form woe to the back and half-back who may have to tackle him. He has a good turn of speed, and at the present time he is, without doubt, the quickest man to receive the ball and make for goal." In the 1895-96 season Derby County finished runner-up to Aston Villa in the First Division league championship. Steve Bloomer ended up that year as the First Division's top goal scorer with 22 goals in 25 games. He also repeated the feat the following season (24 in 29 games) and Derby finished in 3rd position in the league. James Turner, who had been signed from Stoke City in 1896 had a very good season. Derby County had a good FA Cup run in the 1897-98 season. They beat Aston Villa (1-0), Wolverhampton Wanderers (1-0), Liverpool (5-1) and Everton (3-1) on the way to the final against Nottingham Forest. 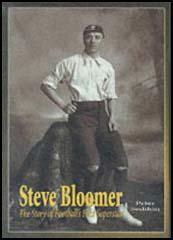 Steve Bloomer scored for Derby but they lost the game 3-1. Steve Bloomer was in great form in the 1898-99 season. Once again he was the First Division's top goal scorer with 24 goals in 28 games. Derby County also reached the FA Cup Final but this time they lost 4-1 to Sheffield United. Derby's long-serving forward, John Goodall, left the club at the end of the season. During his time at Derby he scored 76 goals in 211 games. Derby County continued to struggle in the First Division of the Football League and in the 1900-01 season finished in 12th place. However, Steve Bloomer retained his good form and once again ended up as the league's top scorer (24 goals in 27 games). The following season Derby County reached the FA Cup Final. This time Bury beat them 6-0. This was the third time in four years that Derby had lost in the final of the competition. In 1903-04 season, Steve Bloomer became the league top scorer for the fifth time (20 goals in 29 games). In March 1906 Steve Bloomer, now aged 32, joined Middlesbrough for a fee of £750. Bloomer had scored 240 goals in 376 games for Derby County. Without Bloomer went into decline. The following season Derby finished in 19th place and was relegated to the Second Division of the Football League. Derby finished 6th (1907-08), 5th (1908-09), 4th (1909-10) and 6th (1910-11) in the Second Division. In 1910 Steve Bloomer returned to Derby County. In his first season he scored 20 goals in 28 games. The following season Bloomer, now aged 37, helped Derby win the league title and promotion to the First Division of the Football League. Another important figure in this success was Frank Buckley, who was later to become a very successful manager. Steve Bloomer retired from first-class football in 1914 (he played his last game eleven days after his fortieth birthday). That year Derby was relegated once again to the Second Division. Derby won the Second Division championship in the 1914-15 season. They had to wait until the year following the Second World War for their next success, a 4-1 FA Cup final success against Charlton Athletic. Derby County also won the First Division of the Football League in the 1971–72 and 1974–75 seasons. 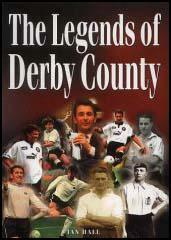 Derby County were founded much later than the majority of teams in the East Midlands. The Derby area had long been identified with a type of football played at Ashbourne, on Shrove Tuesday, which consisted of two groups of men from local parishes kicking and carrying a ball from one end of the street to another with hardly a goal ever scored. Prior to the formation of Derby County in 1884, the Derby Midlands and Derby Junction Clubs were acknowledged as the finest in the area, while the County were associated with Derbyshire County Cricket Team, with many of their players assisting Derby County during the winter months. Arthur Wilson, W M Jervis and William Morley were the early pioneers of the Derby side. Their first official game took place against Great Lever from the Bolton area of Lancashire, for whom John Goodall, who would later render great service with Derby, led the attack. Included in the Derby team against Great Lever were Benjamin Spilsbury, George Bakewell and Haydn Morley, who, together with Derbyshire County Cricketers Frank Sugg and William Storer, formed a side to be reckoned with. Though Derby were considered to be an excellent team, success would be a long time arriving, which would coincide with the arrival of Steve Bloomer, a pale-faced and slightly built young man, who would score prolifically for both Derby and the English national team, thus earning the reputation as the finest goal scorer of the Victorian era. Another great forward is Stephen Bloomer, who is said by a good many judges to stand in a class by himself. He plays to get goals, and when he is in form woe to the back and half-back who may have to tackle him. He has a good turn of speed, and at the present time he is, without doubt, the quickest man to receive the ball and make for goal. He is selfish or unselfish as he chooses, he can combine with any man, or he can play for himself. He is the mainstay of the Derby team, and if they should ever have to dispense with his services there will be plenty of clubs to take him. There is a story told that when Bloomer was first proposed as inside-right for the match against Ireland, about a month before he faced Scotland, a member of the International Selection Committee, our dear departed friend Charles Crump, asked: "Who is Bloomer?" Whether the story can be proved true I doubt, but there was no necessity to inquire again, for he was the free gift of Nature to football. I have seen multitudes of players, but never a more effective inside-forward in a big match. The greater the match the better he played. This is the decisive test of a man in any sport; the capacity to rise above his normal form, to give his best when the best is needed. As he is still with us and occasionally watches a match, such as England v. Austria and a tense Cup tie, it is evident that the passing of years has not killed his interest in the game. He and John Goodall went to see the tie between Arsenal and Derby County, his old club with which his name will always be linked, in February, 1934. How he must have longed to be young enough to have played! to be born in London, but was brought up in Kilmarnock and became a player of the Scottish type, before he joined Great Lever and then Preston North End in its famous days, was with Derby County and saw the boy Bloomer when he was one of the Swifts. Various people have claimed the credit of discovering Bloomer, but Goodall is entitled to it from what I heard one day, when England were playing Scotland at the Crystal Palace. If I remember rightly this was Bloomer's twenty-first appearance in England's national eleven. Bloomer said that day that "Goodall took the greatest interest in me when I was a kid. He coached me, secured me for Derby County, played with me and never failed to give me valuable hints and advice." Yes, he was engaged for 7s. 6d. per week! In 1893 on the Victoria Grounds, Stoke, Bloomer made his first appearance at inside-right in a League match against the chief club of the Potteries. There was a vacancy and Goodall, the captain of Derby County, recommended him at 19 years of age for the position. He finished his career on January 24, 1914, when 40 years old. His club had the confidence to ask him at that age to play centre-forward against Bradford City, and he had the courage to do so. Of course, he scored hundreds of goals. The football annuals tell us that his total in League games was just over 350, but he once reckoned them to be 450. I am not a keeper of statistics, but I do know that he was a match-winner and got 28 goals for England; eight against Scotland, eleven against Ireland and nine against Wales. His first against Scotland was in 1895, and his last in 1907. Some of the newspapers used to say that Bloomer got his usual goal. Once it was reported that Bloomer got his goal, but that was all he did! One smiled, for a goal covers a multitude of sins on the field. Yes, he was a great marksman, and his splendid passes were generally made with one touch. He had no time for fancy work. Bloomer, of course, made mistakes like everyone else, but he was the superior of everyone I ever saw as a scorer. A great volleyer in front of goal, he placed his ground shots at a fast pace, out of the reach of the keeper and slantwise. But the keepers used to say that it was difficult to tell which foot he would use for a shot. They have been known to say, "Steve, you would not have beaten me this time but you changed your foot." And he had an intense admiration for G.O. Smith. The Old Carthusian, according to both Goodall and Bloomer, was so easy to play with, and he was a man without petty pride. Smith used to call out "Steve," and he made the position so favourable that in the twinkling of an eye the ball was in the net. And whether you counted it a good shot or not, Bloomer held that there was never a bad shot that scored. I firmly believe that Bloomer in many respects never had a superior. I remember G. O. Smith, the old Oxonian, telling me that he liked to have Bloomer by his side. "It was only necessary to say 'Steve'," observed Smith, "and before his name had died on my lips the ball was in the net." His play for England was finer than for Derby County or any other club-and that is saying much. Many a goalkeeper has muttered: "Oh, Steve, you changed your foot or you wouldn't have beaten me that time." In one match I recall the goalkeeper had repeatedly stopped Bloomer's shots, but at last Bloomer, exasperated, said: "Stop that, you devil!" And the custodian had to pick the ball out of the net. The most dramatic goal I ever saw Bloomer score in these matches was when the Scottish team played at the Crystal Palace in 1901. It was a damp day, the ground was heavy, and the ball was heavier. Ten minutes from the conclusion Scotland were leading by 2-1, and I had given up the game as lost. The struggle was drawing to a close when I left my seat in the Press box and stood on a grass bank outside so as to get away quickly at the close. Bloomer, who afterwards said that he was nearly "pumped out," got the ball and saw a chance. He touched his reserves of strength, ploughed along over the mud, and steered the ball into the net. He said that this was the hardest job he ever did, and never was he so tired as at the end of that match. So the honour of England was saved. One could write a book about Bloomer's international exploits. That victory of England in 1895 caused the introduction next year of the Anglo-Scots, or sons of Caledonia in the pay of English clubs, to the ranks of Scotland. England, with six amateurs in the Glasgow match, when Bloomer did not play, suffered their first defeat from the Caledonians since 1889. In 1898, when England had about their speediest set of forwards, Bloomer put on the book the second and third goals and won the match. England won every international match that season with ease, and registered three goals in each of them. Those were happy days.